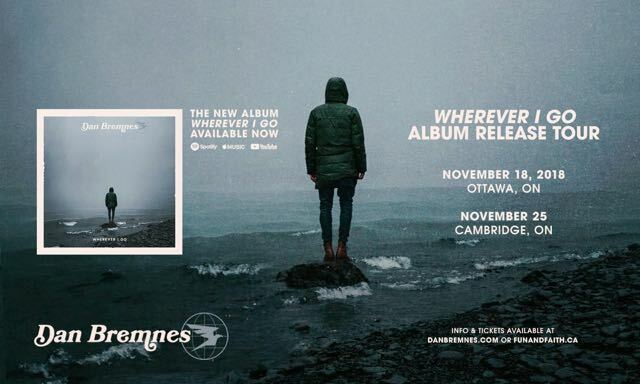 This November, join Juno Award-winning singer/songwriter Dan Bremnes as he performs his new album Wherever I Go in an exclusive one-night only performance and screening in Ottawa Ontario. In addition to sharing the stories behind new songs like “Up Again” and “Wherever I Go”, Dan will also screen a short documentary which tells the story of Dan’s round-the-world adventure that took him to eight countries starting in Vancouver, Canada, before hitting Iceland, Italy, Jordan, Egypt, Dubai, India, China and the USA in eight days and inspired the album. ** As a special offer to patrons of Ottawa, Ontario, Dan is offering ticket buyers an opportunity to purchase his album, Wherever I Go, as a $5 add-on to all ticket purchases. Purchasers will receive an instant digital download of the LP as well as a signed physical CD of Wherever I Go at the concert.